CAMBRIDGE — Musician and composer Brian Amador prepares his family’s favorite dishes as he discusses his passions for music and food. The kitchen has heady aromas from two large simmering pots. In one is red cabbage, balsamic vinegar, and raisins for something he calls “Repollo (cabbage) Sonia,’’ named for one of his twin 14-year-old daughters. In the other, a mixture of ground turkey, tomatoes, and plantains mingle to become Salsa Medibeña, a name Amador coined to reflect Mediterranean and Caribbean influences. Later, he will ladle the meat sauce over pasta. Even when Amador is composing, food is not far away. His most recent work is “Sabor y Memoria’’ (“Flavor and Memory’’), a seven-song suite about Latin food, immigration, and related themes. “The way I love food and music, it made sense. They’re the two things that tie people most to their country of origin.’’ Born in New Mexico to a father from Washington state and a mother whose family lived in the territory before it became a state, Amador says his mother used to speak Spanish to her mother and sisters “when she didn’t want my brother and me to understand.’’ That did not work for very long, he notes. Now he is bilingual. He came to Boston in the late 1970s to attend the New England Conservatory. He has performed for more than 20 years with his Puerto Rican-Argentine wife, Rosi, the last 16 with their Latin roots sextet, Sol y Canto. He completed “Sabor y Memoria’’ in 2009, as a fellow at the MacDowell Colony in Peterborough, N.H. In addition to being the ensemble’s musical director, composer, and guitarist, Brian Amador is his family’s chef, creating most of his own dishes. “I’m not too good about looking at recipes,’’ he says. Though he began cooking when he was young, he became more serious about it in college, “since nobody was doing it for me.’’ He calls his food a “hybrid,’’ combining New Mexican influences from his childhood, Caribbean ingredients he learned to use on visits to his wife’s family in Puerto Rico, and Mediterranean cuisine, which he loves. In the opening movement, “Fas fud’’ (fast food), the music welcomes listeners. 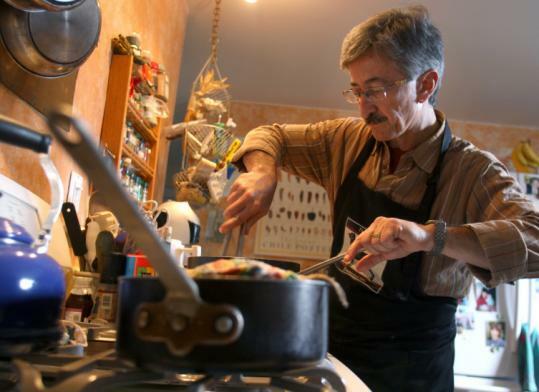 The lyrics begin, “Don’t talk to me about fast food/ Don’t give me that garbage.’’ Amador calls it “the real manifesto.’’ “Alquimia’’ (alchemy) talks about the fun of cooking and how aromas can connect the person at the stove to his or her ancestors. “El tamal’’ (the tamale) celebrates an iconic food in what is perhaps the catchiest movement, with lyrics that trace the history of the dish, traditionally wrapped in corn husks or plantain leaves. The closing “Chocolate’’ starts slowly, with just the string players, and builds to a rhythmic, sensuous piece. “Think of it the way chocolate sits on your tongue before it starts to melt,’’ says the composer. When Sol y Canto performs this suite, which they are doing now as they tour New York, Philadelphia, and San Antonio, they often run thematically related workshops. Rosi Amador, who is the group’s lead singer and managing director, says that at State University of New York Oswego, her husband recently led a group of students in a songwriting workshop, guiding them to turn their favorite food memories into songs. When they performed at Monmouth University, in New Jersey, Brian Amador created a menu and provided recipes for each movement of the suite. Organizers prepared them for the audience. The grand finale was “S’mas,’’ a Latin take on s’mores, whose name is a pun on the favorite campfire dessert (mas is the Spanish word for more). Amador’s version calls for graham crackers, dulce de leche (instead of marshmallows), and dark chocolate, placed under a broiler for about a minute, until the chocolate begins to soften. Amador plans to hold a Healthy Latin Cooking Class in San Antonio as a complement to an upcoming “Sabor y Memoria’’ performance. Dishes include chilies rellenos, platanos maduros (ripe plantains) or tostones (fried green plantains), black bean and sweet potato burritos, and arroz integral (brown rice). He uses whole grains as much as possible, he says, and “change[s] the proportions between starch, vegetables, and protein.’’ The class is hands-on and ends with everybody sitting down to a meal. New food memories, with musical accompaniments.